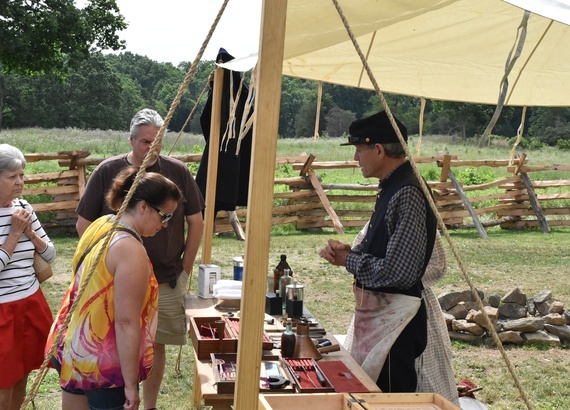 The Gettysburg Foundation will open the historic George Spangler Farm Civil War Field Hospital site to visitors on weekends, June 8 through August 12. Visitors will be transported back to July and August of 1863 as they walk in the footsteps of those who experienced the disruption and carnage of the battle of Gettysburg. The George Spangler Farm is one of the best examples of a Civil War field hospital site on the battlefield today, where upwards of 1,900 men, including Confederate Brig. Gen. Lewis A. Armistead, were treated for wounds both minor and fatal. The Spangler Farm in 1863: Walk near the original farmhouse, summer kitchen and barn, and learn what civilian farm life was like for farmers like George Spangler and his family in the 1860s. Hear the story of a family and farm in crisis, and how the events of July and August 1863 served as a powerful point of passage for the Spanglers and many others whose lives were forever changed. Every Friday, Saturday and Sunday. An Army Field Hospital: Stand inside the barn in one of the best surviving examples of a farm used as a triage and treatment site during and after the battle of Gettysburg. Through the use of letters, diaries, and personal accounts, “meet” some of the 1863 soldiers treated here and “hear from” the surgeons and nurse caregivers worked tirelessly among primitive conditions. Every Friday, Saturday and Sunday. In addition, Living Historians from all over the United States present interactive programming the whole family can enjoy.